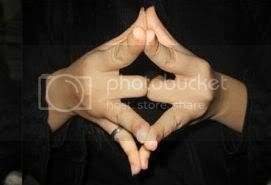 Now join the Index fingers and separate your Little fingers (representing your children)...., they will open too, because the children also will get married and settle down on their own some day. mao ba? wa gyud ko kabalo ana ang akoa pod reason kay ang ring finger ang di kaayo magamit, so di mahuslot... di ba??? I never know that.....thanks for sharing Ginger..
me too, thanks for the info.